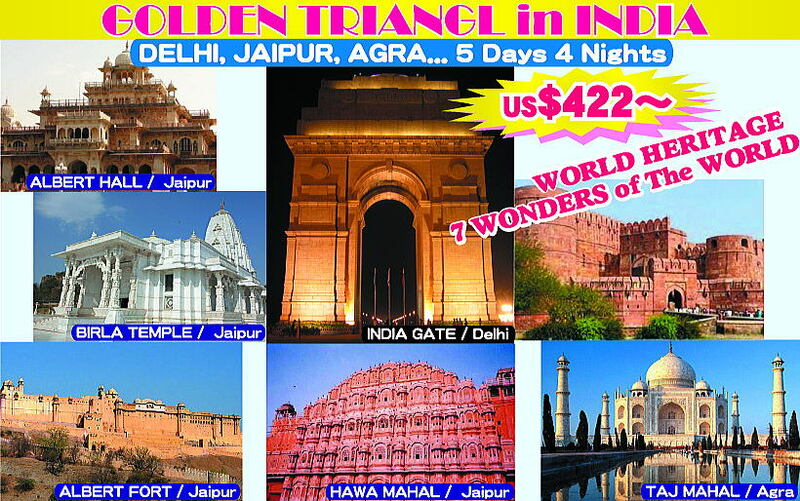 In India, the most popular travel place with foreign tourists is the Golden Triangle. 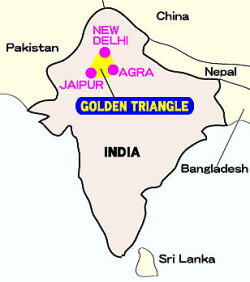 The Golden Triangle refers to three cities in Delhi, Jaipur, and Agra located in northern India. There are five World Cultural Heritages of UNESCO in this triangle zone. Now, let's go to Golden Triangle!! *Above rate are not valid from Christmas Eve and New Year Eve. 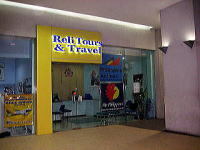 *For passenger 5-9, BIGGER discount awaits!! The Gateway of India is The Indira Gandhi International Airport. India is the birthplace of Hindu faith and Buddhism. 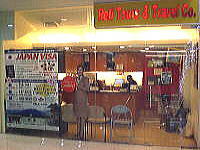 The hands of the Buddha are designed from the wall of an airport lobby and they will meet you. The India Gate is a war memorial and designed by Edwin L. Lutyens. It is a memorial to 82,000 soldiers of the undivided　Indian Army who died in the period 1914-21 in First World War. Jaipur is the capital and largest city of the Indian stat of Rajasthan in Northern India, located in the southwest and about 260 km from Delhi . It was founded on 18 November 1727 by Maharaja Sawai Jai Singh �U, the ruler of Amber, after whom the city is named. And Jaipur is known as the Pink City of India. Albert Hall Museum(photo:left) is a museum in Jaipur. It is the oldest museum of the state and functions as the State museum of Rajasthan. The building is situated in Ram Niwas Garden outside the city wall opposite New gate. The building was designed by Sir Samuel Swinton Jacob and was opened as public museum in 1887. Birla Temple(photo:right) is one of the Hindu temple located on the Moti Dungari hill and was built by white marble. Amer Palace is located in Amer, 11 kilometres from Jaipur. It is the principal tourist attractions in the Jaipur area, located high on a hill, was built by Raja Man Singh. Albert Fort is known for its artistic style of Hindu elements. With its large ramparts, series of gates and cobbled paths, the fort overlooks the Maota Lake. Hawa Mahal is a palace in Japiur..
Hawa Mahal has 953 small windows face a street. So the women of the royal household could observe street festivities while unseen from the outside. "Hawa" is hindu language, means "wind". 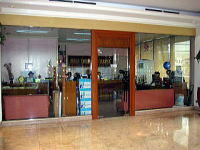 A wind flows in into a building from 853 windows　Therefore, even when hot, it is cool the inside of a building. This is the reason, it is called Hawa Mahal, Palace of Wind. Fatehpur Sikri is located in Agra. It has a meaning called the "victorious capital". The city was founded in 1569 by the Mughal emperor Akbar, and served as the capital of the Mughal Empire from 1571 to 1585. After his military victories over Chittor and Ranthambora, Akbar decided to shift his capital from Agra. 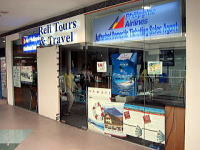 It was registered into world heritage in 1986. The Taj Mahal is a white marble mausoleum located in Agra. It was built by Mughal emperor Shah Jahan in memory of his third wife, Mumtaz Mahal. The Taj Mahal is widely recognized as "the jewel of Muslim art in India and one of the universally admired masterpieces of the world's heritage". It was registered into world heritage in 1983 and one of the New 7(seven) Wonders of the World in 2007. Agra Fort is located in Agra, about 2.5km northwest from Taj Mahal. It is also called the "Lal Quila", it's means "Red Fort". Agra Fort was originally a brick fort, held by the Hindu Sikarwar Rajputs. It was mentioned for the first time in 1080 AD when a Ghaznavide force captured it. Sikandar Lodi (1488?1517) was the first Sultan of Delhi who shifted to Agra and lived in the fort. He governed the country from here and Agra assumed the importance of the second capital. He died in the fort at 1517 and his son, Ibrahim Lodi, held it for nine years until he was defeated and killed at Panipat in 1526. Several palaces, wells and a mosque were built by him in the fort during his period. The Bahai House is known as the Lotus Temple and located in Delhi. A Bahai House is the designation of a place of worship or temple of the Bahai Faith. Regardless of the religion and the cult, anyone can meditate or pray.